Learn more about the Housing Counseling Program. 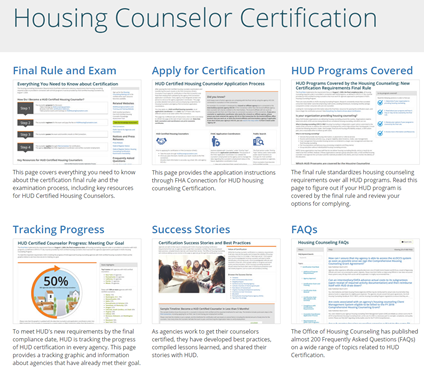 Since the release of the final rule, HUD has been collecting best practices, FAQs, instructional pages, and other resources to help housing counseling agencies meet the new requirements. There is a brand new landing page to gain access to the collection of available certification webpages, including existing and new pages. HUD-approved HCAs, intermediaries and partners came together to share their wishes for the Housing Counseling Program’s 50th birthday in a spirited celebration. Click to watch the video! HUD recognizes the need to expand the number of agencies and counselors who can provide default counseling for HECM borrowers and has released new guidance to help meet this goal. View the new HECM webpage on the HUD Exchange to view HUD's guidance on both origination and default HECM counseling. View a suite of brochures your agency can use to promote housing counseling including the social media toolkit, homeowners guide to success, first-time homebuyer videos and much more. The Housing Counseling Disaster Recovery Toolkit is an online guide created to help Housing Counseling Agencies (HCAs) prepare for disaster events and engage with local partners that receive funding following disasters. This toolkit is for HCAs, Intermediaries, State Housing Finance Agencies, and Multi-State Organizations seeking to play an active and effective role in local disaster preparedness, response, and recovery. This page contains a collection of news, resources, and guidance to assist housing counselors with response and recovery efforts specific to disasters. Check this page for resources for housing counseling agencies and news and updates about the disasters as they become available. View the Disaster Recovery Flyers to help inform members of your community the benefits of working with a housing counselor during emergency and disaster recovery. The Office of Housing Counseling is excited to announce the launch of a new Technology page created for housing counseling agencies to incorporate technology and leverage web platforms in their counseling delivery. Housing Counseling Toolkits: Topics include Agency Capacity Building, Disaster Recovery and Emergency Preparedness, Consumer Protection and Predatory Lending, and HUD Integrity Bulletins. Training Digest: View upcoming trainings from HUD, HUD-funded partners, and other OHC training partners. The Research and Studies page provides recent research evidence on the role of housing counseling to improve housing outcomes for homebuyers, homeowners, and renters.